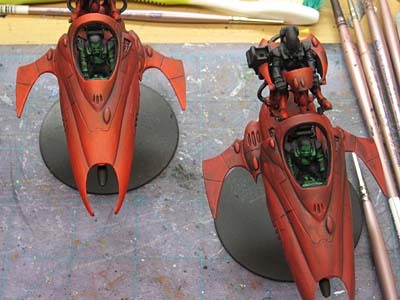 It's been a long time since I've done any work on my all flying Saim-Hann force. I recently sold it to a friend of mine and he requested that I finish it up for him. 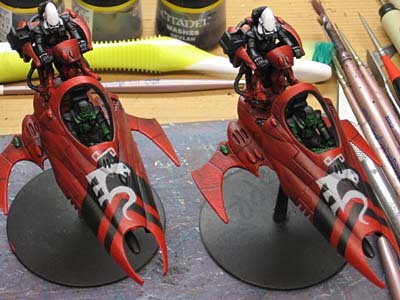 That included the last of the Vypers and a few more Jetbikes to bring the army to 1500 points. The picture above shows them just about done minus the canopies which get added on at the very end. Their bases aren't black, those stands are what I put them on while they're being painted. I spent this past week getting the Vypers finished since I am waiting for some bits to arrive for my next few projects. You can see the difference between the one on the left that has had it's highlighting done and the one on the right that has not. I worked on all three together and made sure to keep a previously finished one nearby to match the painting to. Even though I haven't worked on these guys for the longest time, I still had to match the paintjob that I did way back when. This is getting harder and harder for me to do since I've learned so much over the past year of commission work. Overall, my work has improved due to the sheer volume of painting I've done and I can really tell when I go back and look at stuff I did only a few months ago. 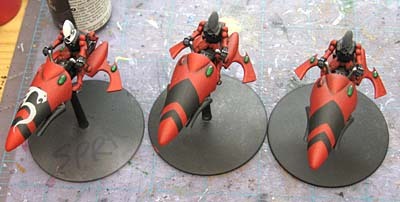 With the Vypers done, I've got two more regular jetbikes to finish and then I can finish up the Seer Council. I think I've got 5 more Jetbikes for that squad to do. Are you freehanding the black lines or masking them out with painter's tape? Consadine: There just freehanded in place. They're all close enough that you can't tell any difference between them unless you look at them really close and compare the exact placement of the stripes and icons. Nice looking miniatures you've got there.